Just like your favorite pair of jeans, it often seems as though just as you’ve gotten to the point of a perfect fit with your hearing aids, it’s time to shop for a new pair. Hey, it’s no secret that we humans like the things we’re used to. There isn’t a tried and true formula that fits everyone in making a decision to shop for a new hearing aid. Like hearing loss itself, each person’s experience is unique to them. It’s important to remember to evaluate the workings of your hearing aids occasionally. Remember how subtle changes in hearing loss can result in major lifestyle changes over time? That doesn’t end once you’ve pinpointed hearing loss and taken steps towards intervention. Sometimes noticing a lesser degree of success in your hearing aids will require only a quick fix, as in a repair. It also may be that the device is not functioning properly. Either way, the best and most efficient way to figure out the problem is to schedule a visit with us at Bay Area Hearing Services to discuss the issue. Age-related hearing loss is a degenerative disease. What that means is that it will most like devolve over time. Certainly, intervening with treatment as early as possible is just one way to protect your hearing in the long run once you’ve had a diagnosis of hearing loss. You can also make smart choices about volumes and safe listening environments. But, we cannot win the fight against time. If you are experiencing less than perfect hearing with your hearing aids, your first step should be to schedule a hearing test with us at Bay Area Hearing Services. We can help to discern whether your hearing loss is indeed more serious than it was when you were initial outfitted with hearing aids. If this is the case, we’ll also be able to present you with a wide range of options to treat your new hearing loss levels. Almost everything in life has an expiration date; hearing aids have a shelf life of five to seven years. No matter the quality and craftsmanship of your hearing aids, there will come a day when they no longer work like new. And that is the goal, really, to have your hearing aids functioning just as expertly every day that you wear them. If you’ve found that your hearing loss remains consistent to the time that you were first fitted for your hearing aids, but that your quality of hearing with them has decreased, it is time to shop for a new pair. You may want to go ahead and reinvest in exactly the same model. But, this is an excellent opportunity to come visit us at Bay Area Hearing Services. You can share the things you loved about your previous pair as well as any shortcomings you experienced. Having to say goodbye to that old pair might be a blessing in disguise if there is a hearing solution even more perfectly suited for you out there! Once a gearhound, always a gearhound. If you’re the sort of person that must have the latest gadget on the market, why should your experience with hearing aids be any different than any of your other beloved devices? In our quickly moving world, it seems that new audiology advancements are constantly evolving. Your current hearing aids might be working adequately and your level of hearing loss unchanged, yet still something is calling to you to invest in the latest tech. That is a perfectly fine reason to invest in new hearing aids and people do it all the time. It is quite amazing the ways in which hearing aid capability and supporting features can progress so quickly. And it might not be the audiological technology that prompts a shopping trip. 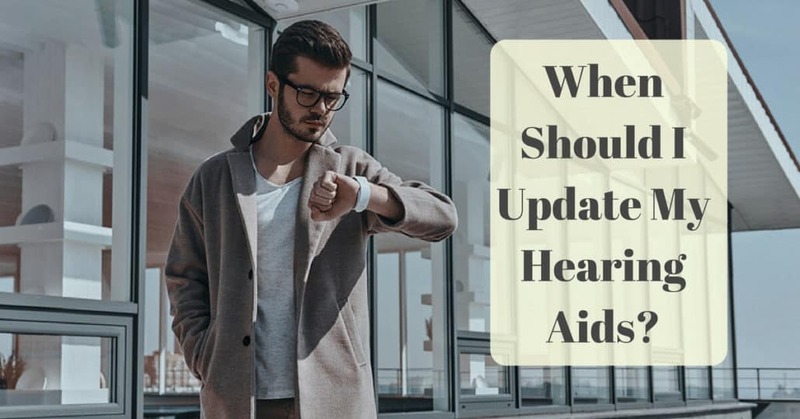 You may have switched brands or features in your other devices that require an update of your hearing aids. Or perhaps an upgrade in your smartphone has encouraged you to take advantage of Bluetooth enabled features you’d never considered before. In any event, an investment in your hearing aids is ultimately an investment in yourself and the rich fullness in which your life is lived. If you’re not completely satisfied with your hearing experience, visit us at Bay Area Hearing Services to find the best solution for you.